On our last morning in San Diego, we paid a visit to the historic Hotel del Coronado. It's hosted many famous people throughout its 100-year history, and we were glad to have seen it. I recall seeing it in the movie "Some Like It Hot" starring Marilyn Monroe, Jack Lemmon and Tony Curtis. I wish we could have stayed here. Maybe someday. 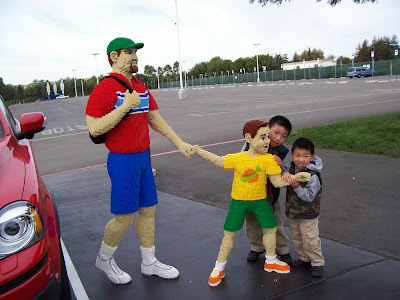 1) The Brewster Boys can only sustain 4-5 hours of activities per day. Any more will increase the meltdown count to unacceptable levels. 2) Russell's stomach can only handle restaurant food every other day. If we eat out on consecutive days, he will vomit in the car. 3) The maximum number of nights away from home before the Brewster Boys start asking about going home is 2. It looks like going to Hawaii is not in our future, at least for the time being. 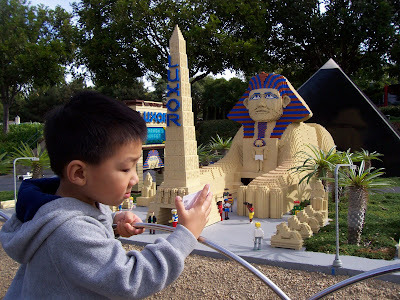 On our 3rd day in San Diego, we headed up the coast for our first-ever visit to Legoland. 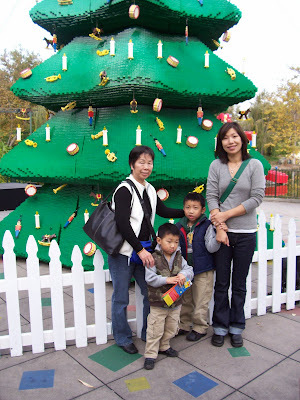 I like Legoland. 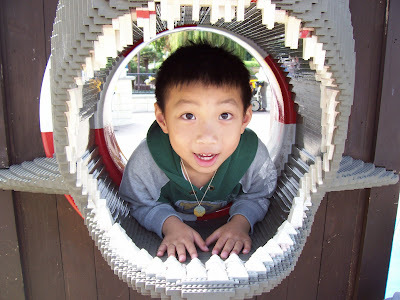 It's a well-executed theme with plenty to do for 2-8 year-olds. For example, it was the first time that our whole family got on a roller coaster together. 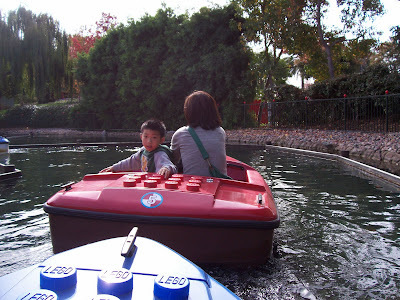 We also tried out a log flume and a couple of boat and car-based touring-type rides. Russell loved the "thrill" rides while Punky got quite bent out of shape, particularly on the roller coaster. A word of caution though: these are scaled-down rides. Definitely not Six Flags or Great America-type rides. But I found them to be just perfect for my aging body. 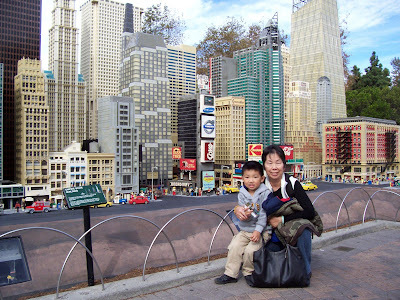 After a couple of hours of rides (we arrived at 9AM), we took a tour of the Legoland's "Miniland". The best parts were the Las Vegas and New York City mock-ups. 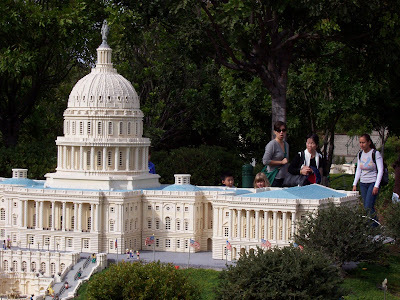 Washington DC and San Francisco were pretty good, too. 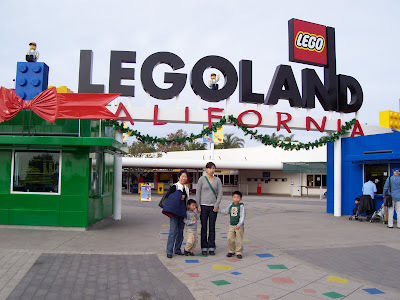 We left Legoland after spending around 3.5 hours in park. That seems to be Russell and Punky's time limit as I've observed over the years. 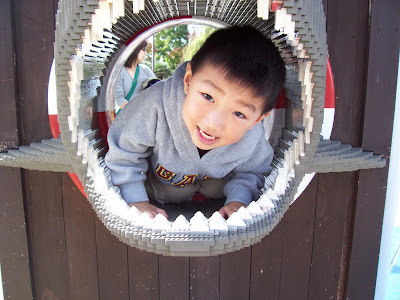 Day two of our mini-vacation was highlighted by our visit to the San Diego Zoo. We arrived a few minutes before the zoo opened at 9AM and took advantage of the fact that the zoo was nearly deserted in the morning. The light attendance made touring the zoo a joy. Not only was it easy to see the animals up close (and to be able to linger, if we desired), the weather was absolutely perfect. Sure there was some walking to be done, but there were beautiful animals and plants to be seen all along the way. The Brewster Boys especially enjoyed seeing the pandas, meerkats and polar bears. We did not bother with the tour bus because we wanted to see all of the animals up close. It took us about 90 minutes to reach the back of the zoo, where the polar bears reside. Along the way, we saw many rare and endangered species not typically seen in zoos, like the red panda and European black bears. The kids loved it because they did not have to jostle for position for a prime viewing spot, plus they could take their time whenever something interested them (such as the pandas). At the rear of the zoo, we hopped onto the SkyFari to make our way back to the front of the zoo. 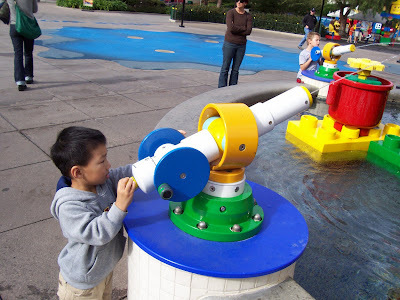 There, we looked around at the Children's Zoo and other exhibits. At around 11:15AM, we noticed a huge hoard of families streaming through the entrance, and that's when we knew we had done the right thing by coming early. By 11:30AM, we were out the door heading towards our lunch destination, having seen around 80% of the animal exhibits at the zoo. After relaxing back at the hotel, we headed towards the wharf and partook in a one-hour harbor tour of the Port of San Diego. It was a nice relaxing activity to end our day.